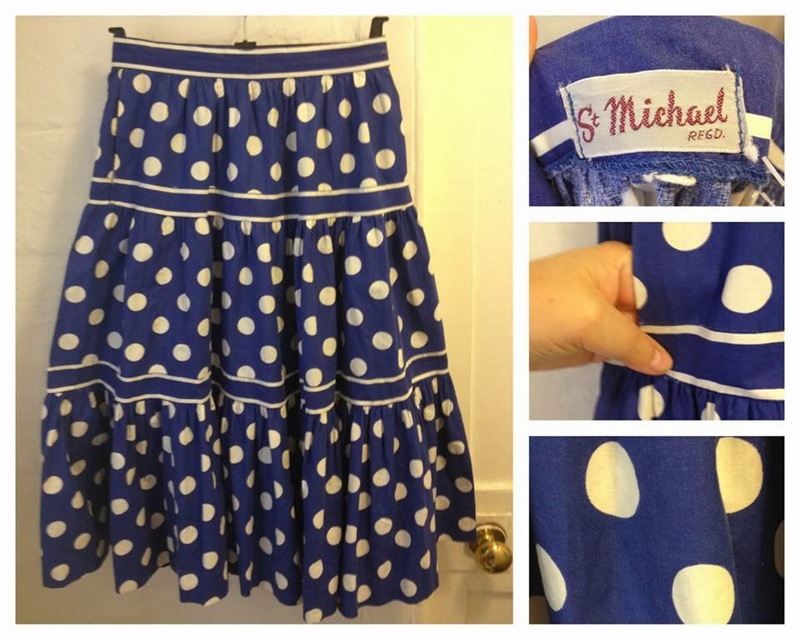 The Secret Dreamworld of a Vintage Girl: A New Fascination: St Michael, A Truly British Brand. A New Fascination: St Michael, A Truly British Brand. I love Marks and Spencer. I don’t know exactly why, but the brand always seems very homely and a true representation of family and security. Whether its because I spent most Saturdays in my local branch as a child I do not know, however I distinctly remember wandering around the fruit counters and trying grapes! My Mum's clothes were all tagged with the white and silver label bearing the name St Michael in italic and although I didn't understand it then, I now know it to be one of the best brands in retail history. Recently I watched a documentary which featured the company and realised that it was quite a pioneer in the creation of the High Street retailer we know today. For example, M&S set great store by trial of new methods and materials, and were one of the retailers who helped in the creation of polyester and “easy wear” fabrics. You only need to look at their rather cheesy yet charming advertisements from the early 1950s and 1960s to see the pride of this. "It's new! It's St Michael!" It was about a year ago when I found and bought my very first piece of vintage St Michael clothing. A skirt with pink roses and a white background, pictures of which can be found on my lovely friend Liz Tregenza’s blog as she owns a duplicate! I didn’t think much of the St Michael brand until I began to find it at vintage fairs. Before it seemed easily accessible, something I had seen regularly in my childhood whilst shopping with my Mum. It was only when I bought my second piece of St Michael clothing that I realised. St Michael had disappeared, giving way to new brands such as Per Una and more recently, the Limited Edition collections. Research reveals that the label was phased out in 2000 and thus, this information spurred me into wanting to find as much as possible. The second purchase I made was at the Vintage Emporium in London, a beautiful near-mint mid 1950s dress in royal blue with white stripes. The label on the inside reads St Michael. REGD 12s, indicating the dress was from the petite range. I bought it for a staggering £85 which was quite a lot for me to spend at the time and wore it constantly to many vintage events, including Vintage Nation in Brighton, the hottest day of the year in 2011 and during a photoshoot at Liz’s house. As much as I love this dress I do struggle to get in and out of it, so it will be looking for a new home soon. If anyone is interested, message me. 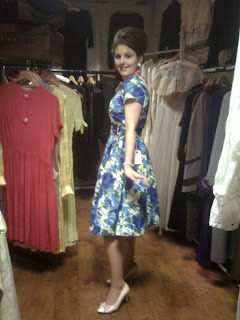 Gradually I began to build a collection and on the day of my birthday party in London I returned to the Vintage Emporium to find a simply gorgeous blue floral St Michael dress (a vintage size 14s) complete with belt. It looked so lovely that I had to buy it. It is now known as my Hairspray dress as it looks exactly like the ones worn in the 2007 film. Then, back in July I began my job working at my local M&S in the brand new Shoe Department. This prompted a further investment in more 1950s and 1960s M&S “St Michael” items and I took to Twitter asking for pieces, and received several replies that my best option would to be to buy direct from a vintage fair as no one had any in stock. Since then I have managed to accumulate quite a few items from eBay. As anyone who knows me will tell, I am very competitive. I always have a rather large collection in my Watch List yet rarely attempt to purchase everything on it. There are usually one or two items I will select as potential purchases and then wait patiently (or rather impatiently) until the auction. 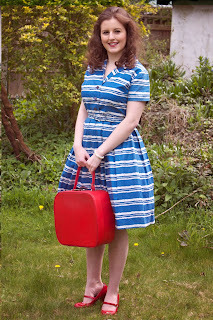 On the first occasion I found a lovely 50s St Michael cotton dress, listed as a plain 1950s dress with no description in the title. However, on closer inspection I noticed the distinctive St Michael label and selected it as a potential purchase, seeing off 9 other bidders to get it for £34. I also spotted a dress on eBay which was truly the epitome of girliness. Pink gingham with a lacy trim and pearlescent buttons, it was perfect. Priced at £75 I felt this was too expensive, so after three unsuccessful attempts to sell the dress at various decreasing amounts, the seller withdrew the dress and after contacting them, we agreed a price. The dress was mine and arrived a few days later, wrapped in tissue paper and neat as a pin. It is simply the most stunning St Michael dress! Whether or not this fad will stay is another matter but for now I am quite happy to keep adding to my increasing collection!